Actually, one could think that I don’t have any time to be creative because of all that studying. 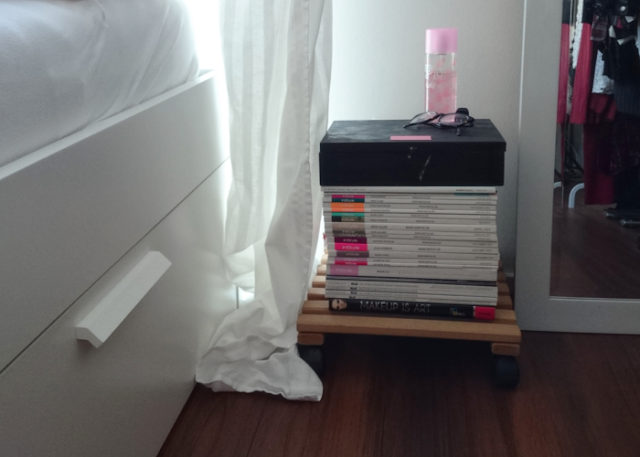 The truth is, though, that there were two things bugging me: 1) I didn’t have a bedside table which means that I have to do some sort of acrobatics to get my phone or whatsoever while lying in bed. Not cool. And 2) that huge pile of old magazines took way too much space in my bookshelf. Also not cool. I just HAD to do something. Then I saw this picture on instagram, and – boom – problems solved! 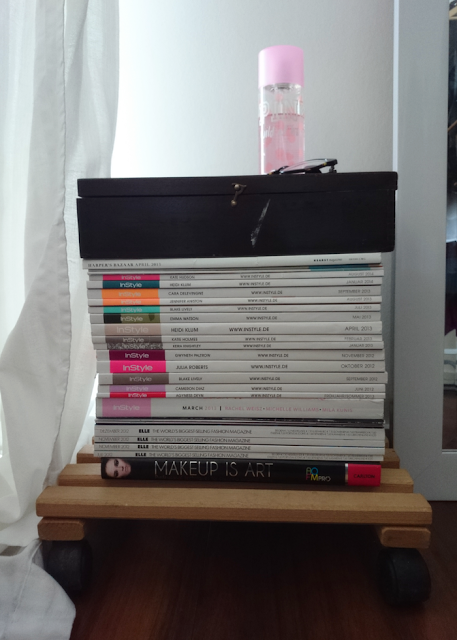 So I made my own nightstand aka the magazines with a pretty box on top. 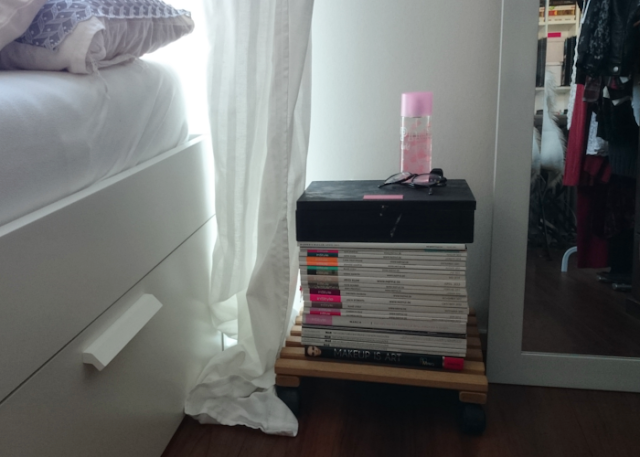 I couldn’t simply place that arrangement next to my bed, though, because I still need to open the drawer. So I placed one of these crazy things with little rolls/wheels underneath. And there goes my movable fancy nightstand! I really like it and it’s very practical and all, but guess what? I spent 15 min looking for my glasses yesterday because I forgot that I now have a nightstand. Oh my. Also, did you already check out my GIVEAWAY? You can win a very pretty infinity ring! "fashion | current obsession: black"
"inspiration | life update and shenanigans"
Tolle Idee, leider hab ich vor kurzem soooo viele Zeitschriften weggeschmissen…. Your recurring use of 'not cool' made me laugh. :) This is such a great idea! 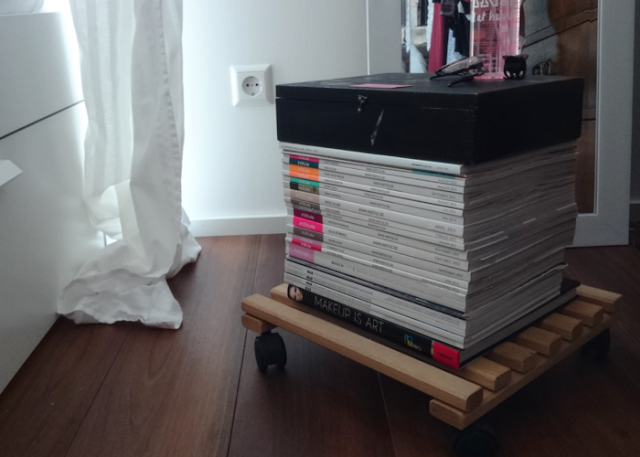 I actually have the same problem with my old magazines, but I don't want to throw them away.